It is well past midnight. 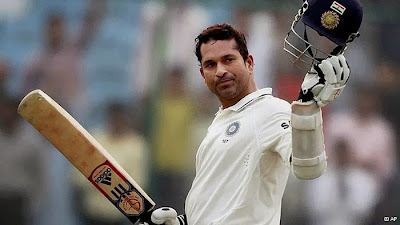 It has been more than 20 hours since Sachin Tendulkar announced his intention to retire following his 200th Test next month. MEDIA has gone into what can only be called its tsunami mode. Its forces have gathered, scattered out emails, made dozens of phone calls, scoured through the archive, and presented you, the beloved reader, with a Himalayan range of words, pictures and numbers to mull over. Every arm of social media has been shaken. Along with other cricketers, and 100crore of people who are drilling in their minds to pick one of their favourite Tendulkar memory I was also busy remembering my fav moment.Today, though, it was as if the news of Tendulkar has set us free - in heart, mind, and memory,and hurt deep down inside. In the time Tendulkar has played for India, we've all grown up, grown old, but never grown apart from cricket. Maybe it was him, maybe it was his time. Maybe we're just a bunch of sentimental fogeys between the ages of 5 and infinity. Throughout his career, Tendulkar has kept reaffirming the faith and belief that no matter what, there was much in cricket that could be uplifting, exceptional, clean. News of his impending retirement was not unexpected - over the last 18 months much has unravelled around Tendulkar at a somewhat dismaying speed. In the context of an unrelenting 24-year career, however, what is remarkable is that the tailspin did not take place earlier. To many, our 40s are when we finally secure our place in the world and find the discipline needed to keep middle-aged maladies at bay. To cricketers it is the time the mind becomes quicksilver sharp to the game's demands, but the body falls half a step behind. For driven, competitive creatures like Tendulkar, who are seekers and finders of sustained excellence, accepting the march of time must be tougher than we can imagine. As Tendulkar's batting has dipped and his struggles have mounted, we have wrung our hands in misery and helplessness. Our worries have been about "legacy" and "timing" and "appropriateness", our anxiety centred around the notion of a Tendulkar "legend". "I have seen God, he bats at no. 4 for India"
We've probably got it all wrong. To Tendulkar, perhaps the legend or the idea of legacy does not exist. All that existed was a fresh set of difficulties, to which he responded with the only method he had ever practised: by looking for yet another new route to adapt to a rapidly changing inner dynamic. He flung himself at the problem, like he always had with other problems - more practice, more hits, more nets, more training. It was his way of rattling the gates of the cricketing gods, and it had always worked. When the announcement came, the first response was a tumult, a cascade. Tendulkar had made up his mind, he had bitten the bullet. It was done, and maybe like us he feels free too. Now it means we, like thousands of others, don't have to worry about him and for him anymore. Then his career flashed past in the mind's eye and all of us found ourselves in it. It contained the past all the years of our own lives, tagged on somewhere as we watched, applauded, cursed, celebrated, whirling around in suspense, joy, mortification, gratitude.